This guide will walk you through creating an EMDK For Android application that will use some new Mx features introduced in EMDK for Android API to perform device configurations. Mx represents a suite of Enterprise Features on top of standard, commercially available Android Open Source Project. 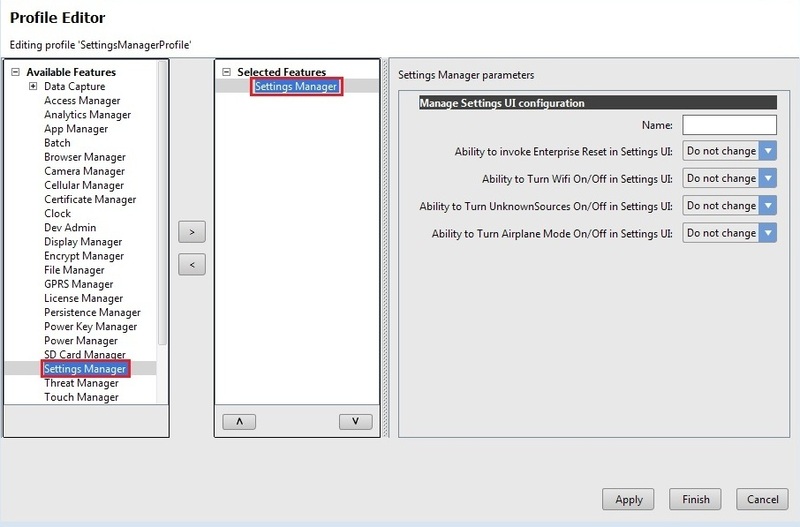 So this tutorial will focus on the ability to configure Enterprise Reset option in Settings UI on your Symbol device using Settings Manager feature of Mx. 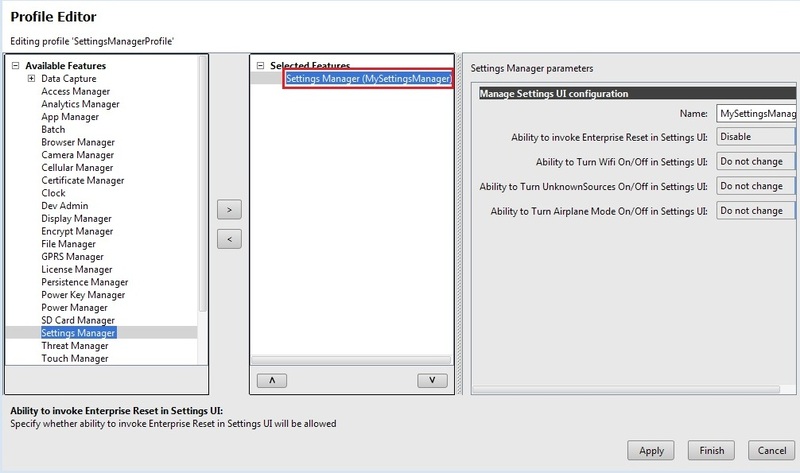 So now we will create a tutorial and disable the ability to invoke Enterprise Reset in Settings UI of your Symbol Android device using Mx Settings Manager feature. A typical use case for this could be to prevent user by accidentally pressing "Enterprise Reset" option. Note: Provide "MxSettingsManagerTutorial" as the project name for this tutorial. Start by creating a new Android Studio project. Click here to see how to add a specific feature to the Profile Manager. 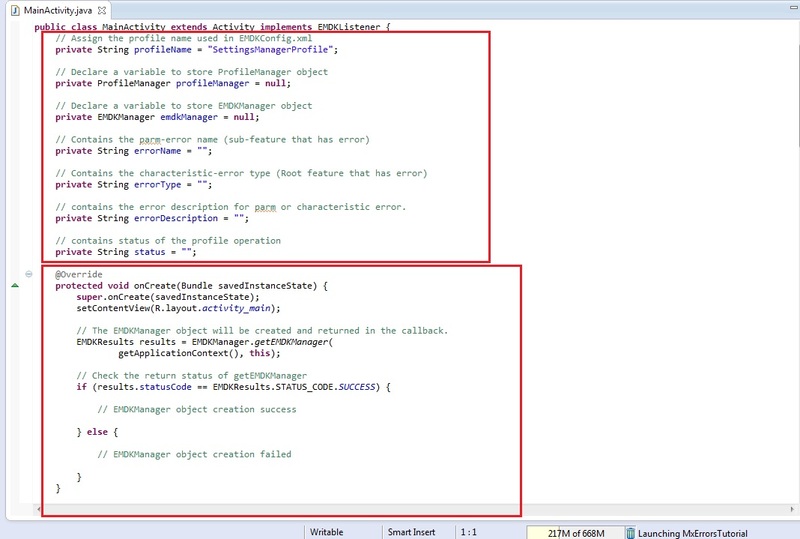 Provide "SettingsManagerProfile" as the Profile Name for this tutorial. 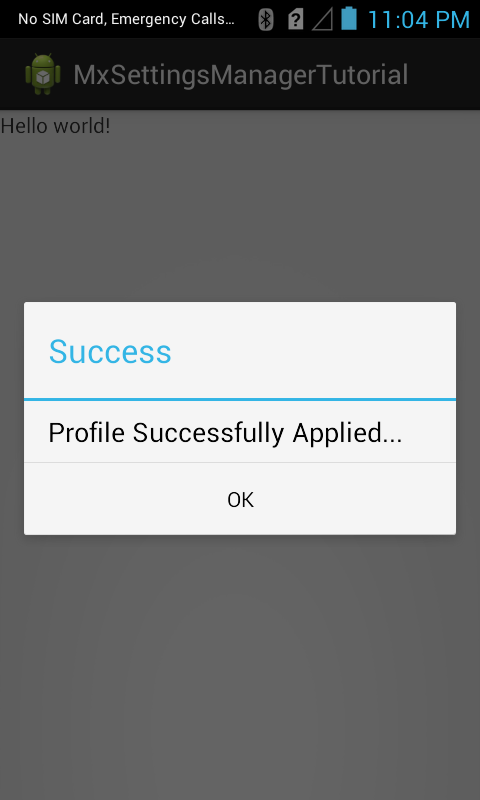 Note: You can provide any Profile Name but make sure to access it with the similar name in the Android code. Now, you can see all these MX features on the left hand side of the Profile Editor window. Select the "Settings Manager" feature from the list and click "Right Arrow". Provide some name in the "Name" field (Ex. MySettingsManager). The "Name" field is used to identify each feature, which is required when editing features programmatically. You can also keep the "Name" field empty. 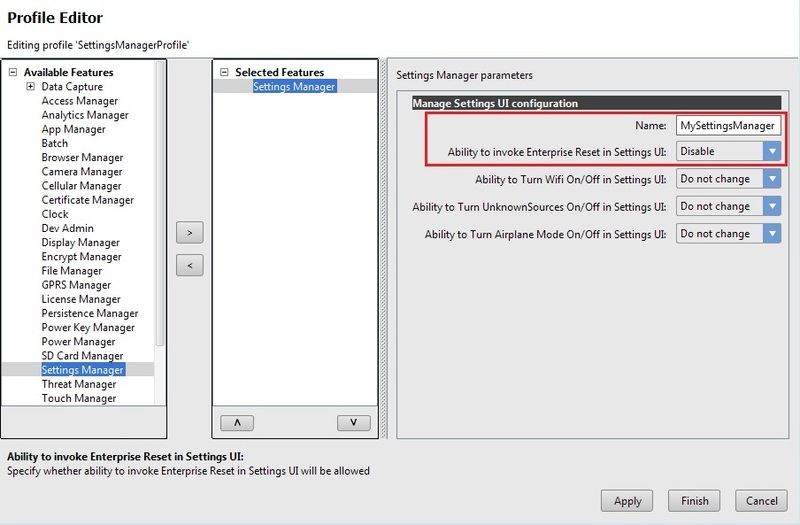 Since we want to disable the Enterprise Reset option in Settings UI, select "Disable" in "Ability to invoke Enterprise Reset in Settings UI" drop-down. You can see that Settings Manager also offers some additional features such as turning ON/OFF Wi-Fi, UnknownSources and Airplane Mode on Settings UI. Note: You can Enable, Disable or keep the existing settings based on your selection from the drop-down. 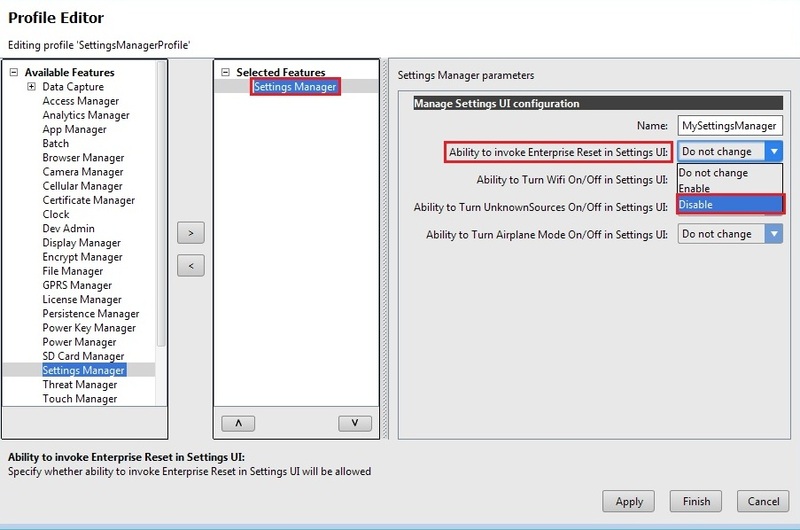 Click Finish and your Settings Manager profile for disabling Enterprise Reset option on Settings UI is created. Now the "EMDKConfig.xml" is created under "\assets" folder. This file will contain a definition of all of your profiles that you create. You can inspect the "EMDKConfig.xml" created under "\assets" folder to see it is reflecting the changes made to the parameters via EMDK Profile Manager GUI earlier. However, it is advised that this file not be manually updated and only be controlled via the Profile Manager. Modify the Application's Manifest.xml to use the EMDK library and to set permission for the EMDK. Now we will start to add some code. 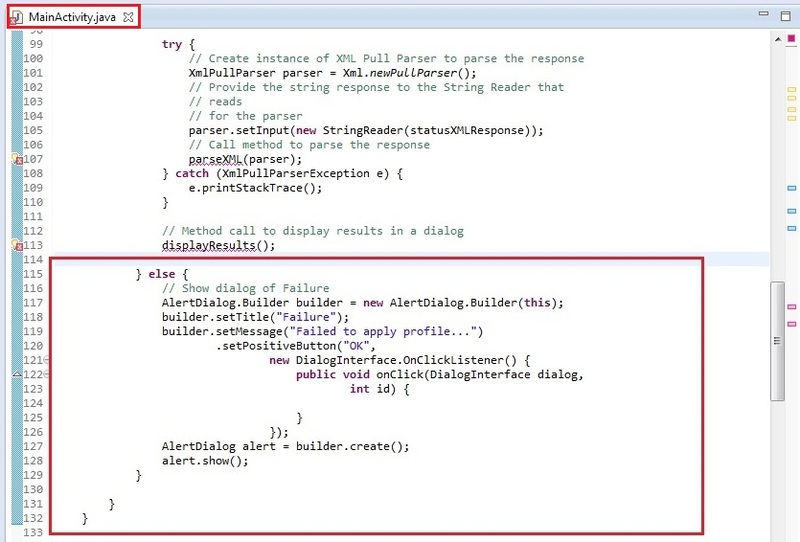 Then you must extend the activity to implement EMDKListener. 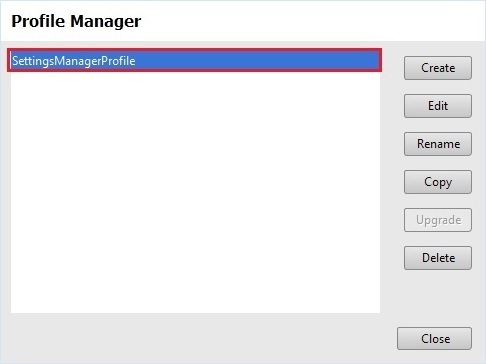 We will now create some global variables to hold the profile name as well as instance objects of EMDKManager and ProfileManager with a status variable while applying the profile. Some of the variables are used to hold the name, type and description in case of any errors. These variables would be used throughout the code. 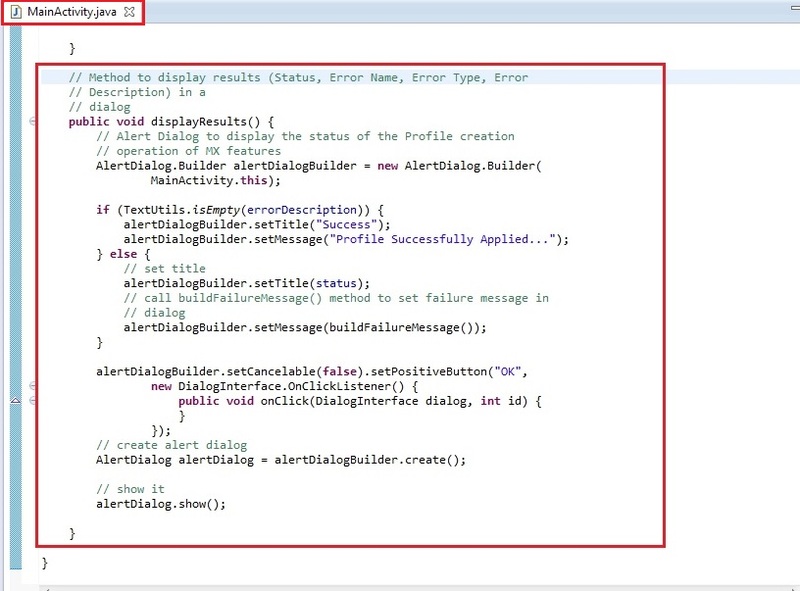 Note: Verify the Profile name in the code with the one created in the Profile Manager. They both should be identical. // contains the error description for parm or characteristic error. 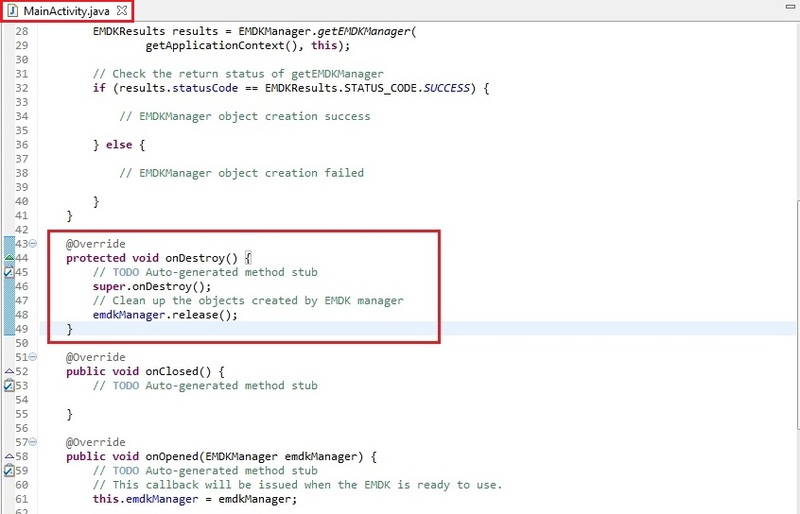 In the onCreate method, we call getEMDKManager so that the EMDK can be initialized and checked to see if it is ready. // This callback will be issued when the EMDK is ready to use. 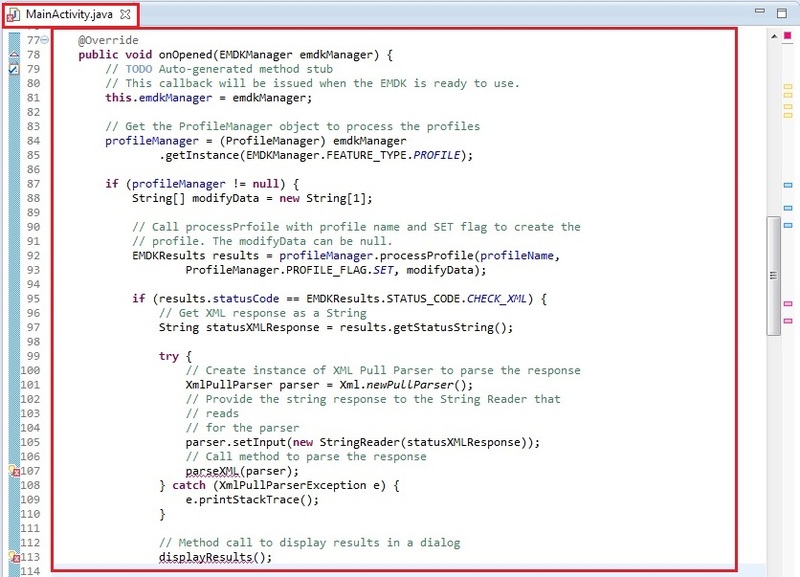 // Call processPrfoile with profile name and SET flag to create the profile. The modifyData can be null. This processProfile method returns the result of applying a particular profile that we set using EMDK Profile Wizard in EMDKResults reference. If the profile is successfully processed, it retuns the status as CHECK_XML and then we go on and parse the response to get further details whether the profile was applied successfully or not. Otherwise we display a Failure message in a dialog. Note: 1. There is a difference between processing a profile successfully and applying a profile successfully. Note: 2. If the status is other than CHECK_XML, we are simply displaying a failure message. You can actually go ahead and check different types of status and display the appropriate message accordingly, which is not in the scope of this sample tutorial. In case of CHECK_XML status, We retrieve XML response string from the result using getStatusString method. Further, we would parse this XML response string using XML Pull Parser in order to get the status and error parameters if any. XML Pull Parser is an interface that defines parsing functionality provided in XMLPULL V1 API (visit this website to learn more about API and its implementations). In the parsing we would be looking for specific status tags (Error Name, Error Type and Error Description) in case of any errors and if found, we would get those values in the respective global variables that we have declared in previous step. Note: Here we have called the method parseXML to parse XML response string. We will declare the method in the next step. Once the response is parsed, we would display the result of applying this profile in a dialog by calling displayResults method, which we would declare in coming steps. You will see few errors as we have not declared the respective methods to parse the response and display result. Lets do it one by one. In this step, we will create a method parseXML that uses XML Pull Parser to parse the XML string response and set the status and error parameters if any. In the response, we are supposed to capture name and desc for parm-error tag, type and desc for characteristic-error tag in case of any errors. You will still see one error as we need to declare displayResults method to display the result of profile operation in a dialog. Before displaying the results, we should form the content of the result to be shown first, specifically in case of errors. This could be done by creating buildFailureMessage method. Name and description of error if the response contains parm-error. Type and description of error if the response contains characteristic-error. 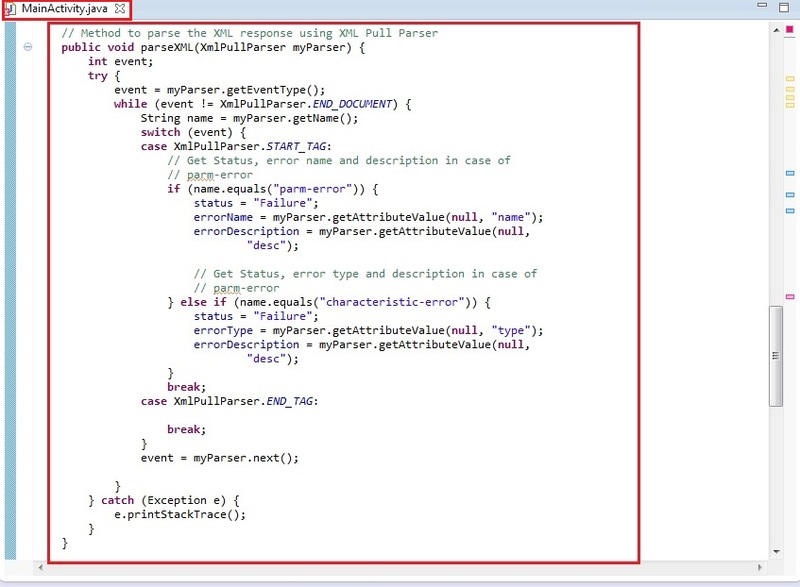 Name, type and description of error if the response contains both parm-error and characteristic-error. 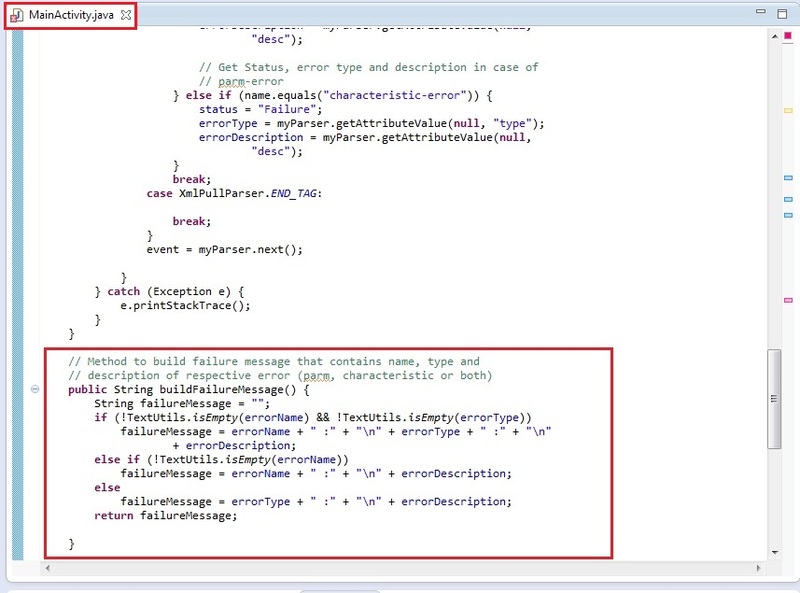 The buildFailureMessage method would have following code to match the above mentioned criteria. failureMessage = errorName + " :" + "\n" + errorType + " :" + "\n"
In this step, we will add displayResults method to display the result of profile operation in a dialog. The dialog would display status as Success or Failure with corresponding message based on the response of profile operation. You can see that all the errors are gone. That's it!!! We are done with all the coding and configuration part that will let us disable Enterprise Reset in Settings UI on our Symbol Android device. Now let us run the application. Connect the device (having the latest EMDK runtime) to USB port. Make sure the device is in USB debug. You can see an Alert Dialog with a success message, which indicates that the app has successfully disabled the Enterprise Reset option in Settings UI. Note: In case of any errors, you will see a Failure status with respective error message in that dialog. We will now verify this by going into the device's Settings. You can see that the Enterprise Reset option is disabled from settings UI. This is how Settings Manager is used to configure Enterprise Reset option in Settings UI of your Symbol device using Profile Wizard. 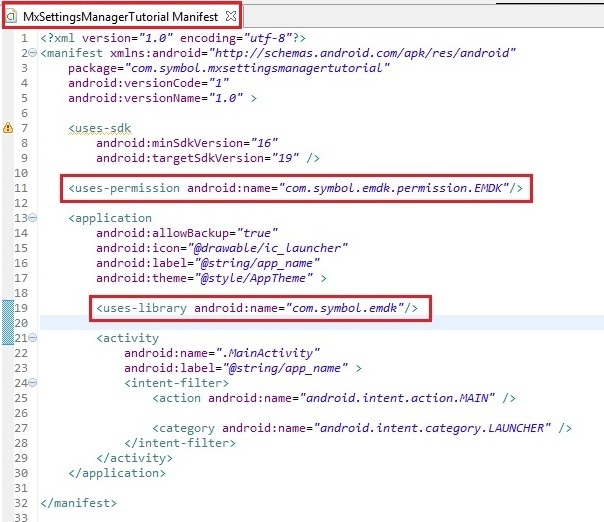 Installing the EMDK for Android application without deploying the EMDK runtime on the Symbol device will fail because of missing shared library on the device. Use the DataWedge v1.7.12 or higher version to test the ProfileManager.processProfile() for DataWedge profiles. 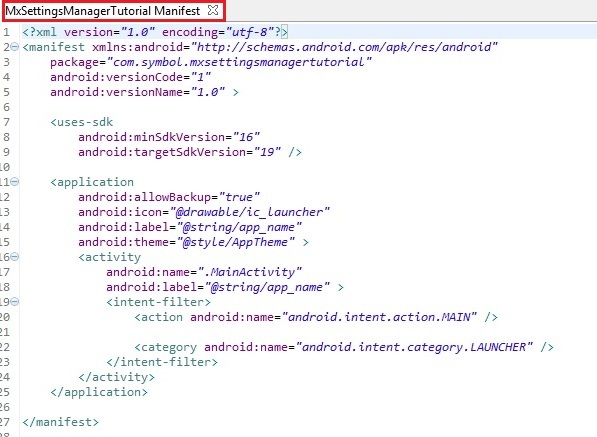 Now that you have learned how to configure Settings UI with Enterprise Reset option using Settings Manager on your Symbol Android devices through applications, let us try to understand and implement some of the other new Mx features introduced in V 3.0. So in the next tutorial, we will concentrate on the "USB Manager" Mx feature and try to explore this feature by creating a tutorial.